Eighteen year old, Alexia Hilbertidou is CEO of her company Girl Boss and is passionate in encouraging girls to consider the opportunities the STEM courses offer in sciences, technology, engineering and mathematics. Her key concerns are the lack of women in CEO roles globally and how the future of females in the workplace needs to ensure more women make it into growth areas. Dr Pralene Maharaj’s story was very moving, when as a 26 year-old, part way through her medical studies, she contracted Guillain-Barre Syndrome, a rare and debilitating disease. Her journey to many achievements and her recovery was truly inspirational. Two-time Olympian, ex-New Zealand Hockey player and coach, Christine Archer, was an entertaining speaker sharing her strong mantra of the four C’s: Courage, Commitment, Choice and Confidence – helping young women be the best they can be. 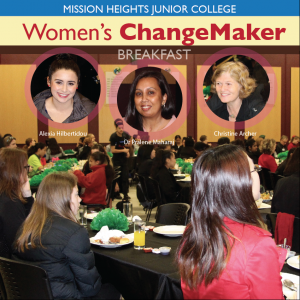 During the breakfast students were seated alongside additional table guests – all successful young women in careers of Publishing, Marketing, Agriculture, Design, Engineering, Infrastructure, Electronics and Bio Medicine. MHJC students excelled in the recent NIWA Science Fair with an outstanding high level of awards. The Fair is an annual event, celebrating the excellence in scientific and technological investigation carried out by Auckland Year 7 to Year 13 students. 1. Double winner Joanne Ting won Highly Commended in Years 9 to 13 Secondary Consumer Science as well as First Prize in the Award for Best Project Using Flour. 2. First Place Winners in the category Years 9 and 10 Living World – Leane Te Boekhorst and Solana Carpenter with presenter Lynn Dunbar. 3. Second Prize Winner in the Travelwise Award – Anmol Singh Dhillon with presenter Eadaoin Butler. 4.Highly Commended in Myth and Go project in the category Years 9 to 13 Secondary Consumer Science, Rajbir Sandhu with presenter Lynn Dunbar. 5. 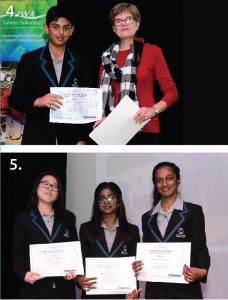 Highly Commended contestants in the category Years 9 and 10 Living World – Ariel Kim, Caitlyn Pillay and Trishika Nand. 6. 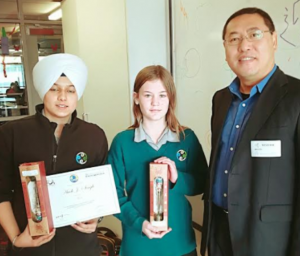 First Place Winners in the category Years 7 to 10 Technology and Innovations – Ricky Bassno and Aadi Golcha with Jacqui Davidson from category sponsor KP Group Ltd .
7. 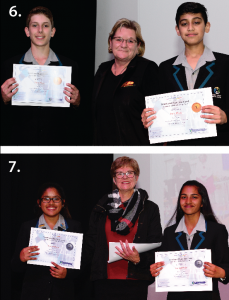 Second Place Winners in the category Years 9 and 10 Living World –Jamini Patel and Camryn Chetty with presenter Lynn Dunbar. 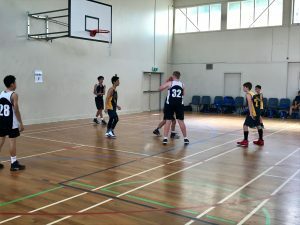 An excellent result from our Year 7 & year 8 boys Basketball Team! After six fast-paced games, MHJC beat rival Farm Cove by 6 points to reach the semi-finals. They then went on to defeat St Kentigern Boys 17-12. This saw our team placed third overall in yesterdays South Eastern Zone Tournament. Captain Denzel Pereira stepped up to become top points scorer and both Harrison Shao and Leandro Arabelo scored valuable 3 pointers. Great effort from the entire team. Our school performed an amazing kapahaka at this years Kōanga Festival on Saturday morning at Somerville Intermediate. 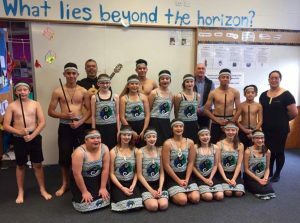 It was a day of many ‘firsts’ – first performance for most in public, first time performing at the Kōanga Festival, and the inaugural performance of our school haka: ‘Kia Mana Ake’ – ka mau te wehi! Congratulations to the group, you did us proud; and a big thank to all staff and supporters in the audience. 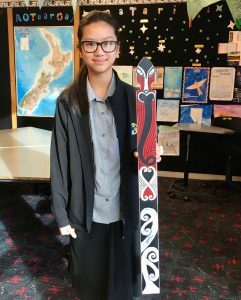 Māori and Pasifika Coordinator, Jason Tuhaka, has congratulated Tra Mi Nguyen (7W2) for designing the winning Mission Heights Junior College picket to represent the school at this year’s Kōanga Festival. The picket reflects our students voices characterising aroha (love) kotahitanga (oneness) and kia mana ake (growing greatness). Great work Tra Mi. There will be over 30 South-Eastern schools taking part, showcasing the beautiful taonga (treasure) of kapahaka. Dr Fu, the National Advisor for Chinese, visited our College in August to present awards to the winners of the Chinese Bridge Speech Competition. 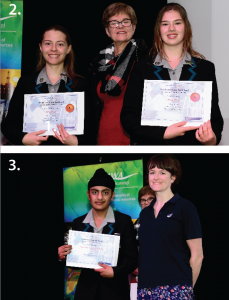 Congratulations to winners Elsa McCormack (8M2) and Aadi Singh (9C1) shown below, receiving their prizes. Dr Fu was impressed by our facilities and our Chinese Teaching Programme. 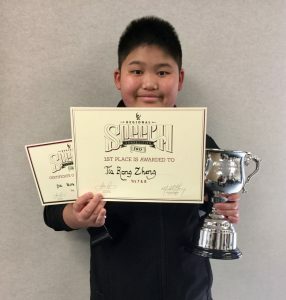 Later, he taught a Year 7 class how to use chopsticks with first prize of the Chopsticks Challenge going to Leo Cao (7C1). Dr Fu gave advice on expanding our language programme to include trips, scholarships, culture and language exchanges and establishing a relationship with a ‘sister school’ in China. Dr Fu specialises in Chinese teaching pedagogy and is skilled in calligraphy and Tai Chi. He supports Chinese teaching programmes throughout New Zealand by visiting schools, organising events and running workshops. 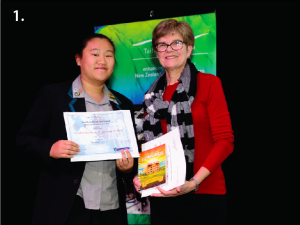 Congratulations Nathan Zheng (8C2) for being placed first in the Kelston Deaf Education Centre Year 7 & 8 Speech Competition. Nathan is really happy to have won as he set himself this goal after placing second last year. Organisers described his presentation as outstanding! Wellington – Parliament, Politicians and (Te) Papa! 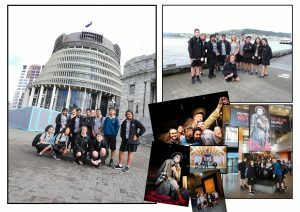 Year 9 students took part in an exciting day trip to the Capital this week. First up was a visit to the Beehive, New Zealand’s parliament buildings. With the 52nd general elections looming, this was perfect timing to learn more about our country’s electoral system and a chance to visit the House of Representatives – where Ministers of Parliament (MPs) and Select Committees meet to debate and vote on matters of national importance. The MPs weren’t sitting at the time of our visit as they were campaigning for their Party in their own electorates. This was followed by a fascinating guided tour exploring Te Papa Museum with its rare exhibitions and collections. Students were in awe of the stories behind many pieces from New Zealand’s history. For many of the group this was not only the first time on a flight but also the first time to Wellington. 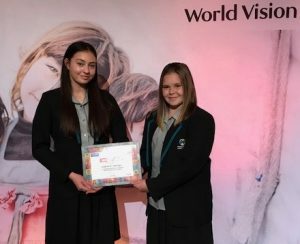 A phenomenal result for this year’s 40-Hour Famine from Mission Heights Junior College was recognised at a celebration Awards evening held this week at Elim College, Botany. Over $10,000 was raised by our pupils choosing to either give up food, technology, furniture or even talking – for a whole weekend in June! As one of the top fundraising schools this year, a special acknowledgement was also made to Maddison Taylor’s personal effort of raising $1,000. Thanks all for a huge effort for a great cause raising money for the Syrian Refugees. Shown here are students (from left) Maddison Taylor (10W1) and Georgia Hall (10F2) accepting the awards on behalf of our school.